What Types of HVAC Systems Does Amana Sell? 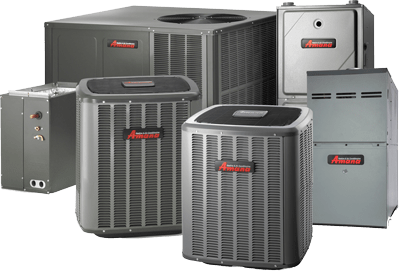 Amana HVAC has been making central air conditioners since 1954, over those 60+ years the company has gone from forging a path in a new industry to becoming a proficient supplier and manufacturer of heating and cooling products. The company is owned by Goodman but produces its own line of products. The Amana air conditioners are available starting at 13 SEER (Seasonal Energy Efficiency Ratio) and going all the way up to 24.5 SEER. The top three products come with ComfortNet technology to help improve control over the units. Amana heat pumps range from between 15 SEER and 18 SEER. The top two heat pumps are equipped with ComfortNet technology. When choosing an Amana furnace you’ll have to choose between standard efficiency and high efficiency. The standard efficiency units are all 80 percent AFUE (Average Fuel Utilization Efficiency). The high efficiency units range in AFUE from 92 percent to 98 percent. The top four furnaces all come with ComfortNet technology. Ductless Aman HVAC units are known for their high efficiency levels because heat isn’t lost as air moves around the ducts. Amana sells single room and multi-room split ductless systems for both heating and cooling. The company also sells single room ductless air conditioners. Top of the line Amana HVAC products are designed to work with their proprietary ComfortNet Control system. These full-color thermostats provide a great deal of control over the units. They can control multiple devices around your home. The controls access the Internet, they function with wireless accessories and offer control over things like fan speed, heat pump balance point, heat and cool cycles, and even humidity with the right equipment. The backlit screen is simple to read and the various controls are split into multiple menus to keep everything organized and make it simpler to use. Before purchasing any Amana equipment it’s important to know that the company’s heaters and air conditioners division is owned by Goodman. If you’re familiar with the Goodman name and Goodman equipment, Amana products are very similar. In fact, all the Amana warranties are handled directly by Goodman facilities and the Goodman name shows on Amana warranty documents. Most Amana equipment comes with a parts warranty for up to 10 years after the installation, but only when customers register their equipment within 60 days of installation. Amana equipment should be registered as soon as possible. If equipment isn’t registered in time, Amana will only warranty it for five years after the installation is complete. Amana is known for standing behind its products, but only if you take the time and put in the effort to make sure the heater, air conditioners or whatever you purchase from Amana is registered properly. Amana products are built to last and don’t typically have many problems, but if they do you could find yourself footing the bill for a technician even if the equipment is covered under warranty. The warranty doesn’t typically cover labor or shipping. When looking for a contractor, it’s a good idea to try and find someone that warranties their work and that will come out and fix issues without charging you to do it. While you won’t get a technician who will make all the repairs without charging you, it’s important all their work is warrantied so you aren’t paying for the same service multiple times if they make mistakes. Before hiring an installer to put in your Amana unit make sure that they have experience with Amana or Goodman brand products. Goodman recommends that homeowners and business owners look for technicians with the NATE Certification. NATE stands for North American Technician Excellence and shows that the technician has had proper training. Amana and Goodman don’t have their own training or certification program like some other suppliers do, so it’s a good idea to look for technicians that are highly rated with good reviews and that have advanced certifications.